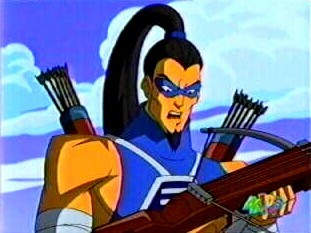 Bowmaster is an archer hero who tried to join the Justice Force. He appeared in the 2003 TV series. Bowmaster was one of three hopeful applicants (along with Moleculo and Gauntlet) trying to join the Justice Force when the team decided to expand its membership roster. However good their intentions were, all three were heavily criticized by Zippy Lad, who told them that their gadgets alone wouldn’t make them heroes. Just at that time, Nano had been accidentally reconstituted by Baxter Stockman, but a reprogramming attempt gone haywire was scrambling his judgement, making him alternately trying to seek out the Justice Force for help and attacking them. The first three heroes he met were Bowmaster and his companions, who – with the exception of Moleculo – immediately took up the fight against him. Despite a valiant effort, however, Bowmaster was quickly struck down after his arrows proved ineffective against Nano’s robotic body. Bowmaster’s current status with the Justice Force remains unknown. Bowmaster makes use of a quad-grooved crossbow which allows him to fire up to four arrows at the same time. His two quivers contain a selection of high-tech arrows, including explosive-tipped ones. The full extent of his arsenal, however, remains unknown.